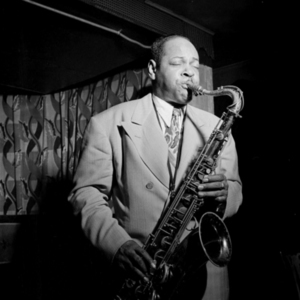 Coleman Randolph Hawkins, nicknamed "Hawk" and sometimes "Bean", (1904-11-21 ? 1969-05-19) was a prominent jazz tenor saxophone musician. He was an important pioneer on the instrument, and many consider him the father of jazz saxophone. During his long career Hawkins was always inventive and seeking new challenges. He directly influenced many bebop performers, and later in his career, recorded or performed with such adventurous musicians as Sonny Rollins, who considered him his main influence, and John Coltrane. During his long career Hawkins was always inventive and seeking new challenges. He directly influenced many bebop performers, and later in his career, recorded or performed with such adventurous musicians as Sonny Rollins, who considered him his main influence, and John Coltrane. He also performed with more traditional musicians, such as Henry "Red" Allen and Roy Eldridge, with whom he appeared at the 1957 Newport Jazz Festival. In the 1960s, he recorded with Duke Ellington.